Wahama sophomore Emma Gibbs (7) hits a spike attempt during a Sept. 18 volleyball contest against Southern at Gary Clark Court in Mason, W.Va.
South Gallia senior Rachal Colburn (6) leaps for a block attempt during a Sept. 11 volleyball match against Southern in Mercerville, Ohio. 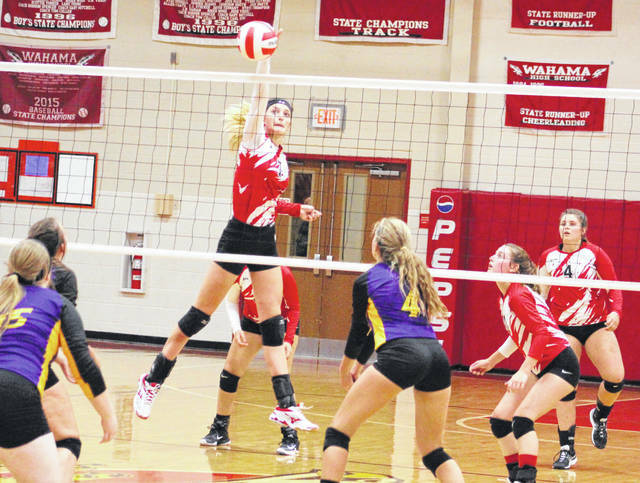 A total of 12 athletes from the Ohio Valley Publishing are were named to the 2018 All-Tri-Valley Conference volleyball teams in the Ohio and Hocking divisions, as voted on by the coaches in each league. Eastern led the way with four selections, followed by South Gallia, Southern and Wahama with two selections apiece in the TVC Hocking. Meigs and River Valley also garnered one choice each on the TVC Ohio squad. 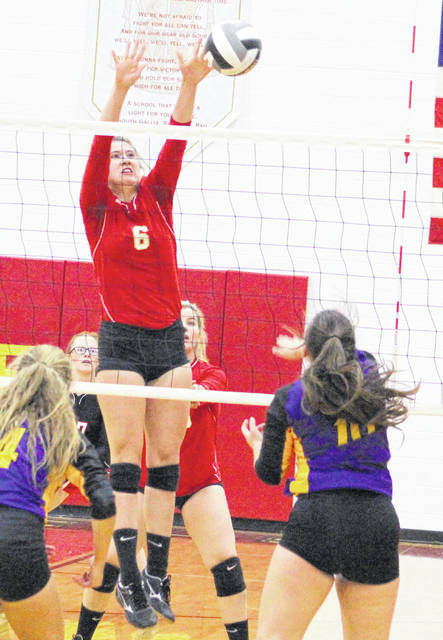 The Lady Eagles finished second in TVC Hocking play, which netted the Green and Gold four first-time selections in seniors Allison Barber and Kelsey Casto … as well as junior Caterina Miecchi and sophomore Olivia Barber. The Lady Rebels were sixth in TVC Hocking action and had a repeat selection in senior Rachel Colburn, as welll as a first-time recipient in junior Amaya Howell. The Lady Tornadoes placed seventh overall and had a pair of first-time recipients in senior Marissa Brooker and junior Baylee Wolfe. The Lady Falcons ended up eighth in TVC Hocking play and had a repeat selection in sophomore Emma Gibbs, as well as a first-time honoree in senior Hannah Billups. League champion Waterford led the way with five selections, plus Kim Barker was named the coach of the year and Haley Klintworth was the defensive player of the year. Miller’s Josie Perani was named the TVC Hocking Division’s offensive player of the year. Alex Teters of Waterford, Taya Lackey of Trimble and Sydney Spencer of Belpre joined Gibbs and Colburn as repeat selections to the All-TVC Hocking volleyball squad. Colburn and Lackey were also chosen to the 2016 All-TVC Hocking team as sophomores. Trimble had three selections, while Federal Hocking and Miller each came away with two choices apiece. Belpre completed the TVC Hocking squad with a single representative. The Lady Marauders — who finished sixth in TVC Ohio Division play — were represented by senior Madison Fields, a repeat selection from a year ago. The Lady Raiders placed seventh in TVC Ohio action and had a first-time recipient in senior Rachel Horner. League champion Alexander led the way with five selections, plus claimed a sweep of all of the special postseason honors. Karsyn Raines was named the offensive player of the year, Mallory Rankin was the defensive player of the year and Nikki Ohms was chosen as the coach of the year. Raines, Rankin, teammate Jadyn Mace and Wellston’s Sydney Mullins joined Fields as repeat selections to the All-TVC Ohio volleyball team. Nelsonville-York followed Alexander with four selections and Vinton County was next with three choices. Athens and Wellston both came away with two honorees each. The complete All-TVC volleyball teams from the Ohio and Hocking divisions for the 2018 season are listed below. 1. ALEXANDER: Karsyn Raines*, Mallory Rankin*, Jadyn Mace*, Jenna Houpt, Erin Scurlock. 2. NELSONVILLE-YORK: Kyla Henderson, Madi Campbell, Audrey Bohyer, Grace Sinnott. 3. VINTON COUNTY: Cameron Zinn, Maylea Huff, Lacy Ward. 4. ATHENS: Sarah Webb, Grace Reed. 5. WELLSTON: Sydney Mullins*, Tressa Lambert. 7. RIVER VALLEY: Rachel Horner. 1. WATERFORD: Alex Teters*, Haley Klintworth, Denise Young, Cara Taylor, Ana-Sophia Bearsley. 2. EASTERN: Caterina Miecchi, Allison Barber, Olivia Barber, Kelsey Casto. 3. TRIMBLE: Taya Lackey*, Laikyn Imler, Macinsey Cooper. 4. MILLER: Josie Perani, Josie Crabtree. 5. FEDERAL HOCKING: Jaylen Rogers, Lindsay Parsons. 6. SOUTH GALLIA: Rachal Colburn*, Amaya Howell. 7. SOUTHERN: Baylee Wolfe, Marissa Brooker. 8. WAHAMA: Hannah Billups, Emma Gibbs*.